Stone Bridge Press, 9781933330990, 178pp. Qin Xue Herzberg: Qin Xue Herzberg is a native speaker of Chinese and a graduate of Beijing Normal University in Chinese Language and Literature. For the past twelve years she has been the upper-level Chinese language professor at Calvin College in Grand Rapids, Michigan. For the past several decades she has taught Chinese to Americans of all ages. She and her husband, Larry, have coauthored books on culture (China Survival Guide) and language (Basic Patterns of Chinese Grammar) and are experts on interpreting Chinese culture for Western travelers, students, and Sinophiles. 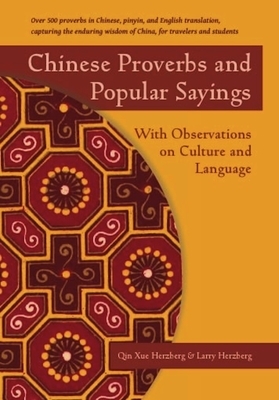 Larry Herzberg: Larry Herzberg studied Chinese for five years at Vanderbilt University before doing his Master's and Ph.D. work in Chinese Language and Literature at Indiana University. In 1980 he founded the Chinese Language Program at Albion College and then did the same at Calvin College in 1984. For the past three decades he has taught the Chinese language at the college level. In 2011 he received the Presidential Award for Exemplary Teaching, Calvin College's highest honor to professors. He and his wife, Qin, have coauthored books on culture (China Survival Guide) and language (Basic Patterns of Chinese Grammar) and are experts on interpreting Chinese culture for Western travelers, students, and Sinophiles.